There's been a ton of discussion lately surrounding iPhone 4 cellular reception. Even before it was officially announced, the reason for the stainless steel band running along the outside of the phone seemed enigmatic; many called it un-apple and decidedly atypical of seamless apple design which eschews hard edges. The black strips were written off as aesthetic curiosities, possibly even markings which denoted a fake. Then at the WWDC announcement, we learned the truth. The iPhone 4's antenna is the stainless steel band that runs around the edge of the phone. The antenna for WiFi, Bluetooth, and GPS is the smaller strip beginning in the bottom left and running to the top, and the cellular radio for voice and data is the much larger strip running around almost three quarters of the phone. It's a design nod back to some of the earliest cellular phone designs which packed external whips that one could manually extend for improving reception. Since then, designs evolved, and until recently virtually all smartphones have packed internal antennas at the bottom of the phone. 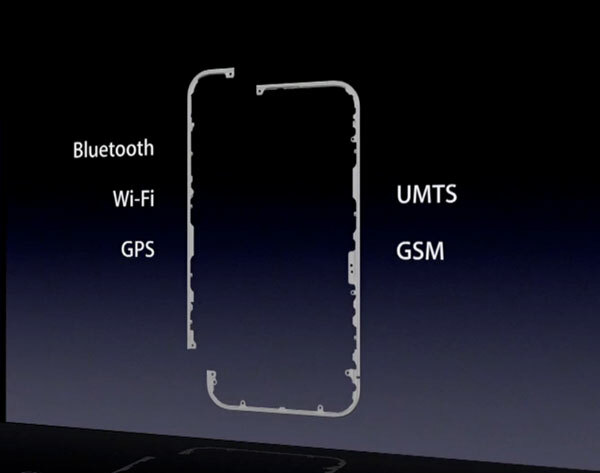 The iPhone 4's external antenna promises improved reception over the internal antenna in the iPhone 3GS. Of course, the caveat is that as with all external antennas, the potential for both unintended attenuation and detuning is much, much greater. When I first saw the iPhone 4's design spelled out watching the keynote online, I immediately assumed that Apple was going to apply an insulative coating atop the stainless steel. Perhaps even use diamond vapor deposition (like they did with the glass screen atop the iPhone 3GS) to insulate the stainless steel from users. We now know rather definitively that this isn't the case. Of course, the result is that anything conductive which bridges the gap in the bottom left couples the antennas together, detuning the precisely engineered antennas. It's a problem of impedance matching with the body as an antenna, and the additional antenna that becomes part of the equation when you touch the bottom left. The fact of the matter is that cupping the bottom left corner and making skin contact between the two antennas does result in a measurable difference in cellular reception. But as we'll show, RF is a strange beast. 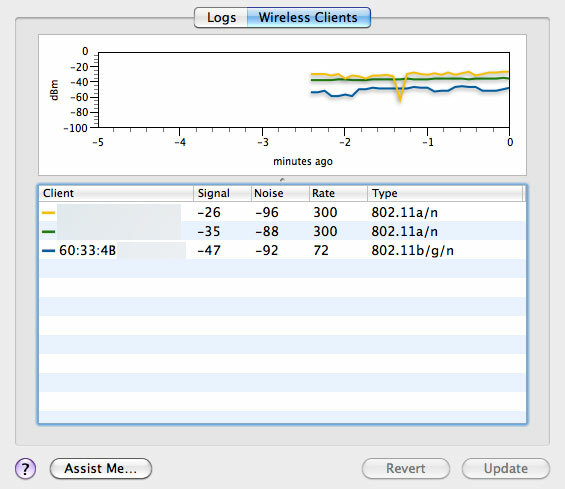 When I set out to characterize and understand the iPhone 4's antenna issue, I noticed that reports online varied wildly. Some claimed that they were always able to recreate a reception issue created by cupping the phone, yet others reported no change at all squeezing the phone tightly. After acquiring my iPhone 4, the first thing I did was try to fire up Field Test via the widely documented *3001#12345#* dialer code. 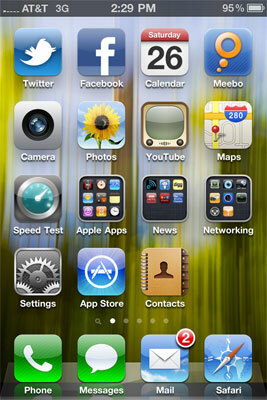 Unfortunately, like iOS 4 running on the 3GS and 3G, Field Test is absent from the iPhone 4. It isn't a matter of the dialer code, it's that Field Test has been completely removed from the applications directory in the filesystem. For those that don't know, Field Test variants exist on virtually every phone for purposes of debugging the air interface and baseband. Quality metrics like RSSI (raw signal strength) usually in dBm are reported alongside a wealth of other metrics like SNR and even what adjacent towers are visible to the phone for handing off. It's a tool usually buried deep in every phone because the amount of data would overwhelm normal mobile users, but is useful for engineers and curious but savvy users alike to find out what's going on with the cellular network. For whatever reason, Apple really doesn't want anyone running that tool anymore. Just about everyone knows that although reporting signal strength in bars gets the job done, it's an absolutely worthless metric for comparison across devices and platforms due to lack of standardization. Further, iOS smoothes the quality metric with a moving average over as much as 10 seconds, masking how fast signal changes. There's also the matter of dynamic range, but more on that in a second. Without any numbers at all it would've been impossible to understand what's going on with iPhone 4. On my 3GS, I exclusively report signal numerically, and as a result have a very good feel for coverage in Tucson, AZ where I live. But I found a way. Undeterred by the lack of field test on iOS 4, I was determined to enable numeric signal strength reporting in the top left where bars are normally displayed. If you've ever run a jailbroken iPhone and used SBSettings, or changed your carrier string, you've probably encountered the fact that iTunes will back up and restore the status bar configuration across OS restores. See where I'm going? I took my iPhone 3GS, downgraded to 3.1.3, jailbroke, enabled numeric WiFi and GSM and backed up. I then took my iPhone 4 and restored with iOS 4, but pointed it to the backup of the jailbroken, numeric-GSM-reporting iPhone 3GS. You'll note that booting and activating the new phone required fitting the new iPhone 4 microSIM into a SIM carrier. I ordered one almost a month ago, but it still hasn't shown up. 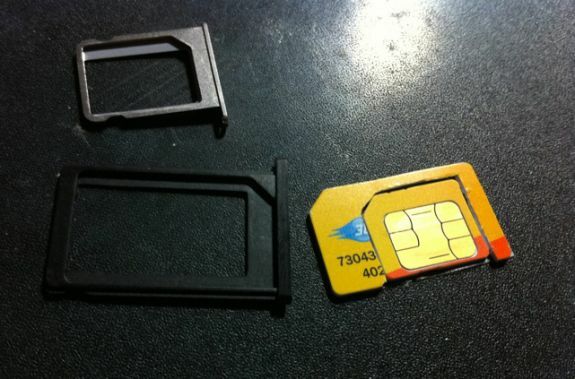 My MicroSIM -> SIM adapter. The real one is still inexplicably in the mail 15 business days later. Success ensued, and I had a numeric readout of signal strength on a non jailbroken iPhone 4. The results are interesting. Before we dive in, let's talk about dynamic range for a second. For a while, I've talked about how iOS reports the quality metric with a compressed, optimistic dynamic range. On iOS, 4 bars begins at around -99 to -101 dBm. 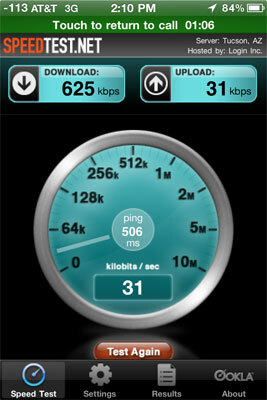 Three bars sits around -103 dBm, 2 bars extends down to -107 dBm, and 1 bar is -113 dBm. To give you perspective, for a UMTS "3G" plant, -51 dBm is the best reported signal you can get - it's quite literally standing next to, or under a block away from a tower. At the other extreme, -113 dBm is the worst possible signal you can have before disconnecting entirely. With a few exceptions, signal power as low as -107 dBm is actually perfectly fine for calls and data, and below that is where trouble usually starts. 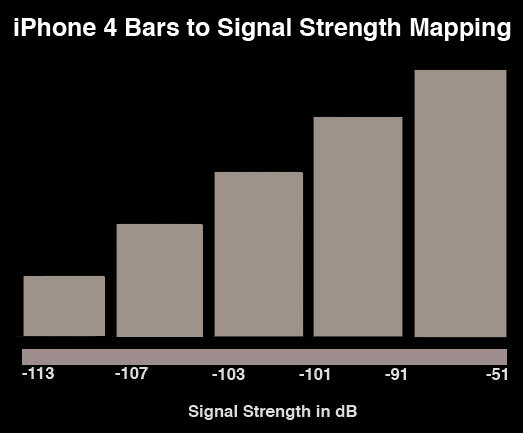 However, you can see just how little dynamic range iOS 4 has for reporting signal; over half of the range of possible signal levels in dBm (from -99 dBm to -51 dBm) is reported as 5 bars. So, an entire day and more than a quarter tank of gas later, here are the results. Holding the iPhone 4 without a case, in your left hand, crossing the black strip can result in a worst case drop of 24 dB in signal. As we'll show in a second, how you hold the phone makes a huge difference across every smartphone - and we've tested thoroughly in 5 different positions. Now, there are two vastly different possibilities for what happens to the bar visualization after you drop 24 dB. I happen to live less than one block from an AT&T UMTS tower (it's across the street, literally), and have exceptionally strong signal in all of my house - it's part of why I chose to live here, actually. Signal is above -65 dBm in every single room, in most cases it's at -51 dBm. When I incur that worst case drop of 24 dB from squeezing the phone, I fall down to -83 dBm, which is still visualized as 5 bars. However, in locales that have less signal, but where iOS still displays 5 bars, the drop of 24 dB is visualized much differently. 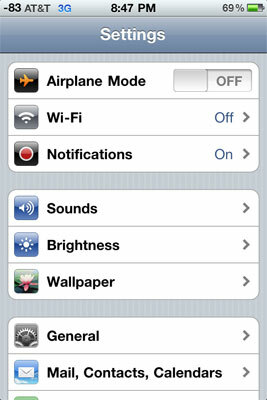 For example, at another test location, signal without holding the phone is -89 dBm, which is still displayed as 5 bars. Cup the phone, and you'll fall all the way to -113 dBm. All the bars dramatically disappear one after the other, people think they've dramatically lost all the signal, and you know the rest. If you're at 4 bars already, (which puts you on the low end of possible signal strengths), cupping the phone even more delicately is enough to push you the remaining 10 or so dB to cutoff. It doesn't take much when you're at 4 bars, which is why the visualization is flawed. Complicating matters is that signal is completely fine until down around 2 bars at -107 dBm. If you add a bumper case to the iPhone 4, the signal strength drop from holding the device is on par if not better than other phones. In the exact same location, in the exact same orientation, I carefully measured my iPhone 3GS and Nexus One with the same AT&T microSIM in my newly made SIM adapter. After lots of testing, I decided on 5 different positions for holding the phone, and tested signal repeatedly. 1) Cupping tightly - This is the absolute worst case and involves squeezing the phone very tightly, like people are doing online in videos demonstrating all the bars going away. I squeeze the phone hard and make sure my palms are sweaty as well. You'd never hold the phone this way because it's physically painful. 2) Holding naturally, comfortably - This is just how one would hold the phone typically in a relaxed way. Not squeezing it to purposefully reduce signal, but making contact with the fingers and not an open palm. 3) Resting atop an open, flat palm. 4) Holding naturally, but inside a case - In this situation the Bumper for iPhone 4, an Otter Box for the 3GS, and a comparable generic case for the Nexus One. 5) Pinching the top and bottom - Our baseline, virtually no attenuation. Held only to keep the exact position constant. It's not reported since this is considered ideal. It's difficult to be exact about the data, since signal is very sensitive to direction, ambient conditions, and cell breathing. To generate these numbers, I measured at least 6 times and took the average. The results are pretty self explanatory. Inside a case, the iPhone 4 performs slightly better than the Nexus One. However, attenuation gets measurably worse depending how you hold the phone. Squeezing it really tightly, you can drop as much as 24 dB. Holding it naturally, I measured an average drop of 20 dB. The drop in signal from cupping the device with a case on is purely a function of us being "ugly bags of mostly water." A material which happens to be pretty good at attenuating RF - thus increasing path loss between the handset and cellular base station. There's nothing Apple nor anyone else can do to get around physics, plain and simple. It's something which demonstrably affects every phone's cellular reception. That's not all there is to the story, however. From my day of testing, I've determined that the iPhone 4 performs much better than the 3GS in situations where signal is very low, at -113 dBm (1 bar). Previously, dropping this low all but guaranteed that calls would drop, fail to be placed, and data would no longer be transacted at all. I can honestly say that I've never held onto so many calls and data simultaneously on 1 bar at -113 dBm as I have with the iPhone 4, so it's readily apparent that the new baseband hardware is much more sensitive compared to what was in the 3GS. The difference is that reception is massively better on the iPhone 4 in actual use. With my bumper case on, I made it further into dead zones than ever before, and into marginal areas that would always drop calls without any problems at all. It's amazing really to experience the difference in sensitivity the iPhone 4 brings compared to the 3GS, and issues from holding the phone aside, reception is absolutely definitely improved. I felt like I was going places no iPhone had ever gone before. There's no doubt in my mind this iPhone gets the best cellular reception yet, even though measured signal is lower than the 3GS. Conference call with three calls going at the same time, and transacting data, all at minimum signal. Impressive. That brings me to the way that signal quality should really be reported - Signal to Noise Ratio (SNR). SNR is essentially a measure of how much of the signal is compromised by noise or interference. It's readily apparent that because the iPhone 4 works almost perfectly fine at -113 dBm, it has much better sensitivity. The deciding factor for reporting the signal quality metric is then SNR, something Apple and other handset manufacturers will have to move to eventually instead of just power. In reality, reporting based on SNR makes a lot more sense, since I couldn't make calls drop driving around an entire day cupping the phone, despite being at -113 dBm (1 bar) most of the time. The drop in signal from holding the phone with your left hand arguably remains a problem. Changing the bars visualization may indeed help mask it, and to be fair the phone works fine all the way down to -113 dBm, but it will persist - software updates can change physics as much as they can change hardware design. At the end of the day, Apple should add an insulative coating to the stainless steel band, or subsidize bumper cases. It's that simple. But what about WiFi? Surely since the UMTS/GSM antenna interferes with it, the WiFi signal has changed as well. It has, though not how one would expect. Holding the phone with no case actually improves WiFi signal strength by a measurable 5 to 10 dB. In the following plot, the dips are me releasing the phone from a tight grip and going to the two finger pinch. I verified the same ballpark level of performance increase on the phone as well. RF is truly an odd beast indeed. It just depends whether you're adding or subtracting length from the antenna, and thus moving away from or closer to an optimal solution. The blue line is the iPhone 4. Look at the rate as well - more on that in a second. The last lingering question is how GPS fix accuracy and acquire time changes depending on how you hold the iPhone 4. I spent a few hours testing and came to the conclusion that there's an insignificant difference gripped or not gripped, or compared to the 3GS. It's also difficult to repeat the same measurement since location services seems to keep the GPS going even after you stop using it, so subsequent API calls to it within a few minutes are very speedy. Getting an accurate location is still nearly instantaneous using WiFi through skyhook, and then AGPS takes it the rest of the way. It's impressive that we're talking on the order of seconds for a location within tens of meters of accuracy - considering that a cold fix on a standalone GPS used to take minutes. If you don't have line of sight to the sky, GPS fixes will take longer no matter what smartphone you're using. I have to wonder whether improved WiFi reception has an effect or not on skyhook (WiFi MAC address and signal strengh based) trilateration accuracy. Again, I couldn't be certain.